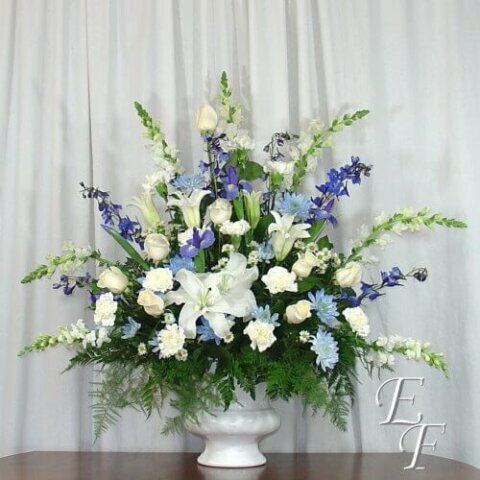 Our Peaceful Blues Urn is part of our Peaceful Blues Sympathy Collection which features white Snapdragons, blue Delphinium, white Lilies, and white Roses. In this design we have also added blue Iris and white Carnations. 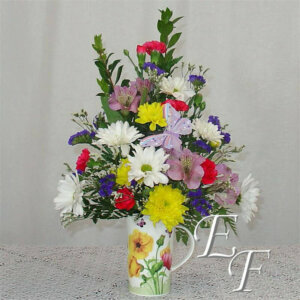 The design is arranged in a white design urn which by itself measures 9 1/2″ tall. The completed design is approximately 40″ wide and at least 40″ tall. 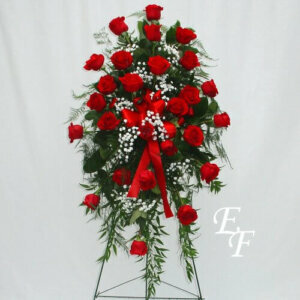 The design as pictured is quite large and showy, but if you want more we have include upgrade options that add Roses and Iris to make the design fuller. 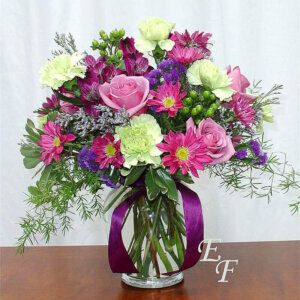 The design as pictured does not show ribbon, however you can add ribbon to the design if you choose to add script. As with all of our designs, you can add script at no additional charge.